Sometimes during vacations or after school young people get bored. They often stroll the malls and some even get into trouble, mostly because they have nothing to do in their spare time. That is why it is important to get your children interested in hobbies and sports at a young age so that they have things they enjoy doing and will not find their time away from school so boring. There are many different things a parent can do to get their children interested in things at an early age. If they are athletic or like sports then sign them up to a soccer team or for dance lessons or baseball. If they seem artistically inclined you can enroll them in arts and crafts courses during their vacation, or you can buy some art supplies and encourage them to work on these at home. A friend of mine introduced her younger children to ceramic arts last summer. 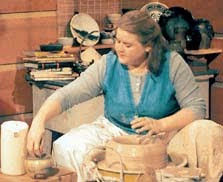 Not into the serious ceramic arts like wheel throwing, because they are too young for that. But she did get some easy to work with clays from an online store AMACO/Brent. She said she found some great safe and non-toxic clays that her children found easy to use and they even molded basic items like small animals and pinch pots. She said her kids loved working with the clay and unlike their Play-Doh creations they had a product that was durable. My friend hopes to keep her kids interested in this art form and has done some research. She said there is much they can do as they grow before needing the use of bigger investments such as a kiln or a potter's wheel. She has discovered some self-hardening clays that her kids can use, and she can use a rolling pin to flatten the clay to a consistent thickness and then they can place the clay over simple molds to get some basic bowls and plates. If they like doing this as they get older she said she may invest in one of the slab rollers to roll the clay out properly as they have table top slab rollers at AMACO/Brent. She even has fashioned a small shelf with wheels for her children to use as a ware cart to store their creations. My friend's kids are still young so it is hard to know how long they will stay interested in ceramic arts. If they remain interested my friend says she will enroll them in some ceramic arts classes as they get older where they will learn about wheel throwing and get to use kilns to harden their clays and set glazes. Right now my friend says her kids really enjoy working with the clay and making objects to give to their family and friends. She has found AMACO/Brent to be a very reliable source of products and information about ceramic arts. Who knows if something like this will keep my friend's kids out of trouble as they grow older? But I think she is doing something right by introducing them to an activity they enjoy and they can explore more as they grow older. very nice information of ceramic Arts for kids.